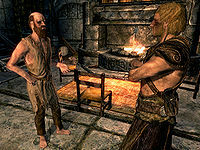 Degaine is a Breton beggar living a cumbersome existence in The Warrens, the place where Markarth hides the poor and sick. 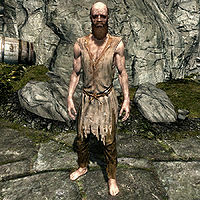 He recruits you to steal a valuable statue from Markarth's Temple of Dibella, having previously been caught in his attempts to steal the statue himself. He used to work the smelter for Mulush gro-Shugurz but broke a few bones and became a cripple. His life in Markarth now centers on two things: sleeping and begging—he will even degrade himself to dance if you provide him with alcohol. He sleeps in his room in The Warrens from 10pm to 8am and then spends twelve hours begging near the market stalls in front of the Silver-Blood Inn. At 8pm he enters the inn and spends the day's earnings on mead. At 10pm he staggers back to the Warrens and goes to sleep. The only exception to this routine happens when you first enter Markarth, in which case Degaine will stay inside the inn while Weylin attempts to murder Margret. He wears nothing but some ragged robes, and he carries an iron dagger and an assortment of lower-class items and a bit of gold. His attitude towards other citizens is quite hateful and, when you approach him, he will shout, "Alms. I said "alms" you backbiter. 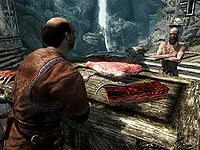 Give a crippled worker a helping hand", "How about a septim? Wait, make that two septims, I feel like living it up", and "Come on, you outsiders always have plenty of gold on you. Spare a piece!" When you hand it to him, he will be equally insulting: "Finally. Now get lost", "Bring more gold next time", and "Tell everyone you see to bring me some septims." When asked for rumors, the innkeeper at the Silver-Blood will gossip: "Degaine the beggar got himself kicked out the Temple of Dibella. Caused quite the ruckus." When talking to Degaine he will explain in his own typical manner that he has his eye on a very special Statue of Dibella: "Aye, a whole heap of it. You see that Temple? Way up there? All them women, keeping to themselves. Won't let poor Degaine in, no. But they've got a treasure in there. Gold statue, size of a child. Who knows what they use it for, but I know what I'll use it for." When you ask if he wants you to steal it he will respond, "Well let's not put it like that. Wouldn't want the Thieves Guild catching wind of us, eh? Nah, just creep in and have a go at taking it out. I'll be here, and pay you half of what my man in Riften promised for it. You'll be helping out an old beggar, and the Divines smile on that sort of thing." If you ask him about the statue again he will respond, "What is there to know? It's in the temple, you bring it out. You bring it to me, I pay you. Now get moving." While you do this thing for Degaine, there's a considerable chance you will trigger the quest The Heart of Dibella, a punishment from the priestesses for catching you stealing. If you, however, manage to steal the statue, Degaine will warn and reward you: "Give it to me quickly, before they see us together. You've riled up the priestesses, and the guards don't take kindly to that. Here's your share. Nicely done." Degaine will then return to his rude behavior towards the customers at the market. This page was last modified on 29 January 2019, at 04:38.